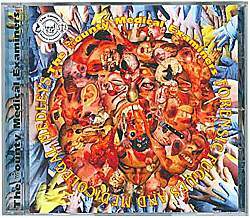 The County Medical Examiners (TCME) is an American goregrind band, whose intended purpose is to emulate the classic goregrind of the 1980s - the early albums of Carcass. 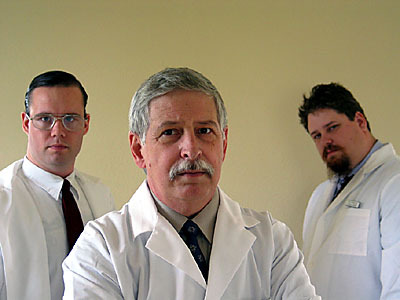 The band is a power trio of actual medical examiners (at the time of their first releases they were still doing their studies) comprising Dr Morton Fairbanks on guitar and vocals, Dr Jack Putnam on drums and vocals, and Dr Guy Radcliff on bass and vocals. Where Carcass would perform Exhume to Consume, The County Medical Examiners do A Brief Discourse On Wound Ballistics. Their lyrical content merely describes what goes on in the morgues of hospitals, rather than discussing grizzly acts of necrophilia and cannibalism. The band's frontman is Dr Morton Fairbanks, who writes most of the bands music and lyrics, though all band members are credited. It should be noted that Dr Guy Radcliff (who is many years the senior of the other two band members) is not a goregrind fan, but joined the band as they were short of a bassist, and out of his professed love for the avant-garde. He joined. Controversy surrounds the identity of the band members, as they use pseudonyms to avoid the wrath of hospital administration and fan attention. One rumor suggests that TCME contains at least one member of Exhumed, mostly because the domain name for the band's website was registered by a former member of Exhumed, and not under the name of the "band members", but it's now commonly accepted that TCME, being uninterested in their online promotion, have many people behind the scenes--including various other Carcass clone bands, as well as Relapse Records staff--donating their time to web design and promotion, as well as guest musical appearances. TCME released their Relapse Records debut, "Olidous Operettas", in 2007. The CD, which took them more than a year and a half to write and record, since all three band members live in different states. Dr. Fairbanks described the effort as "somewhere between Symphonies of Sickness and Necroticism-era Carcass" and "not something you would want to put on before church." What makes the disc even more unique, beyond TCME's odd approach to making music is "It will be a scented-face CD, which essentially means it will be scratch and sniff-able," he said. "Our CD will smell like rotten meat." TCME are an ever increasing band in the goregrind profession, and they are looking for further albums to continue their tribute.